Bristol Aquarium has very sadly had to say goodbye to Luna, the giant Pacific octopus. After laying her eggs and reaching senescence (the last stage of her life cycle), her health deteriorated and for her welfare, the decision was taken by the vet and the Aquarium’s Zoological team to put her to sleep. As part of an octopus’ natural life cycle when they reach maturity, they lay eggs and forsake themselves to tend to the eggs until the end of their life. After laying her eggs at the age of 4 years, Luna had soon stopped feeding and was interacting less with staff. Whilst it was thought she would continue to live happily for a few months longer, she had become extremely lethargic and very pale in colour. Luna was being monitored very closely, as all Octopus react differently to one another during this final stage. Luna’s condition unfortunately deteriorated rapidly over a short 24-hour window, and sadly could not be treated. Luna was a fantastic character, putting a smile on the face of anyone who met her! 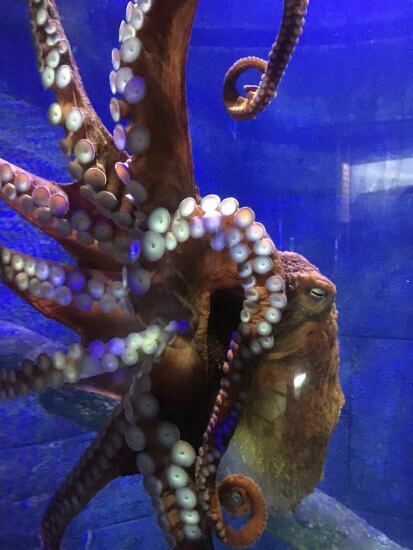 It has been a very upsetting time for the team and the popular octopus will be missed by the Aquarium staff and visitors alike.